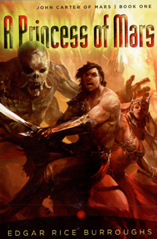 “A Princess of Mars” is the first of the John Carter series, where a regular man discovers that he has great physical powers on the planet of Mars. While prospecting, John Carter escapes from a scuffle in a sacred cave, which takes him to Mars. There, he uses his strength to gain status as a warrior chief. He becomes caught up in the political battles of the two tribes on Mars: the fierce Tharks and the humanoid citizens of Helium. When the Tharks capture the princess Dejah, John Carter protects her and attempts to return her to her people. He eventually leads his band of warriors against the enemies of Helium, winning the hand of Dejah. After living with her for years, the breakdown of the planet’s Atmosphere Plant requires John Carter to once again risk his life. This time, after passing out from a lack of air, he wakes up back on Earth.